The Danish elite rider Sören Nissen who races for Luxemburg wins today’s stage in a furious sprint towards the line, winning just ahead of the Czech rider Milan Damek. Urs Huber and Konny Looser crossed the line right behind in third and fourth. 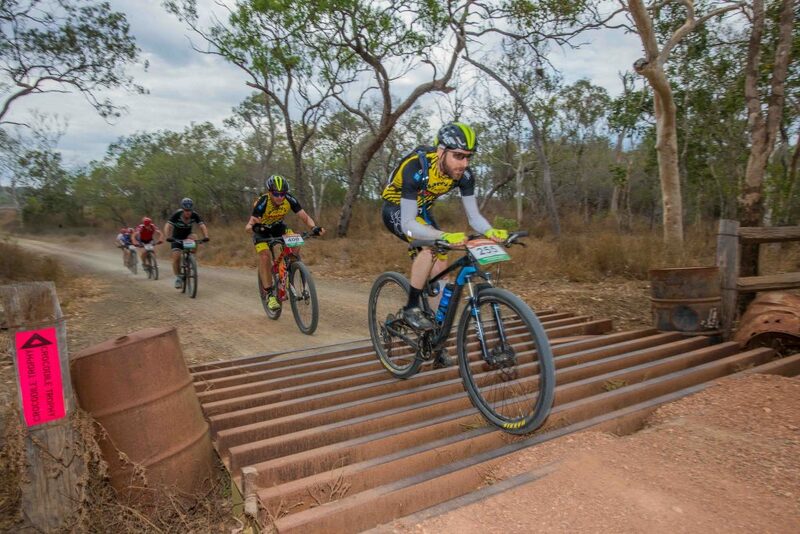 Yesterday’s stage winner Matthias Grick was in fifth with a gap of about 16 minutes. Sjoukje Dufoer repeats women’s win ahead of Sarah White and Lucy Coldwell. 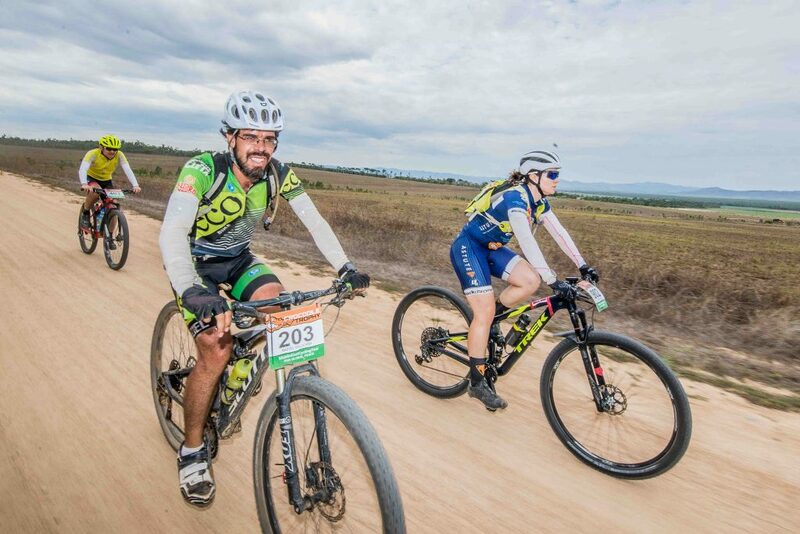 With two stages still to go, the overall standings in elite men and women remain unchanged. 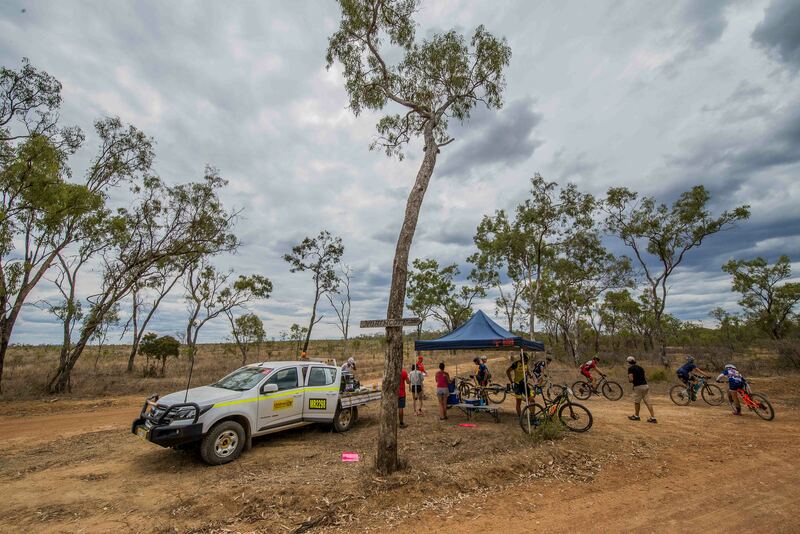 The Crocodile Trophy racers and crew have been relaxing at Skybury Coffee Plantation and enjoyed the freshly-brewed coffee with delicious cakes from the Cafe yesterday afternoon and more coffee with fresh fruit from the orchard for breakfast. 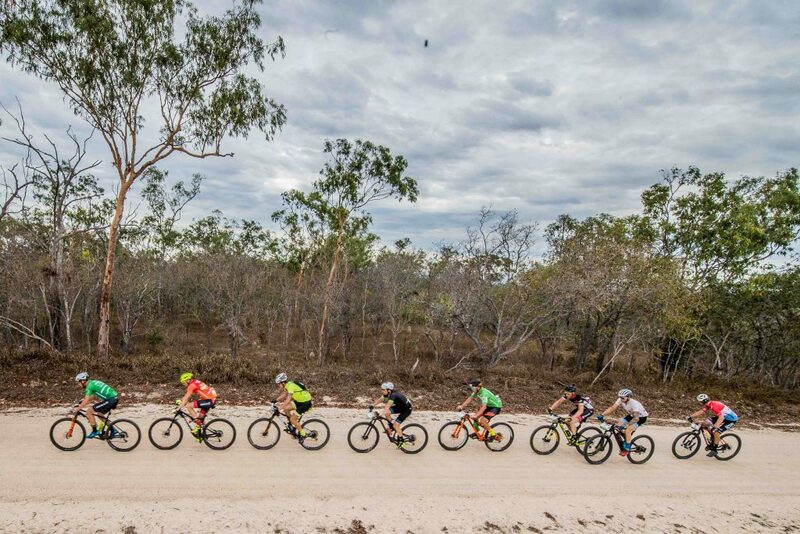 It seems the elite breakaway group of four with Huber, Looser, Nissen and Damek were full of Skybury-energy as they charged towards the finish on today’s day six of the Crocodile Trophy. They had managed to break away on today’s 127 km stage that took them across remote Outback roads and through Mount Mulligan Lodge. Stage winner Nissen is 47 minutes behind the Swiss duo in the general classification in third with Matthias Grick (+01:40:29) in fourth and Damek in fifth (+02:15:56). 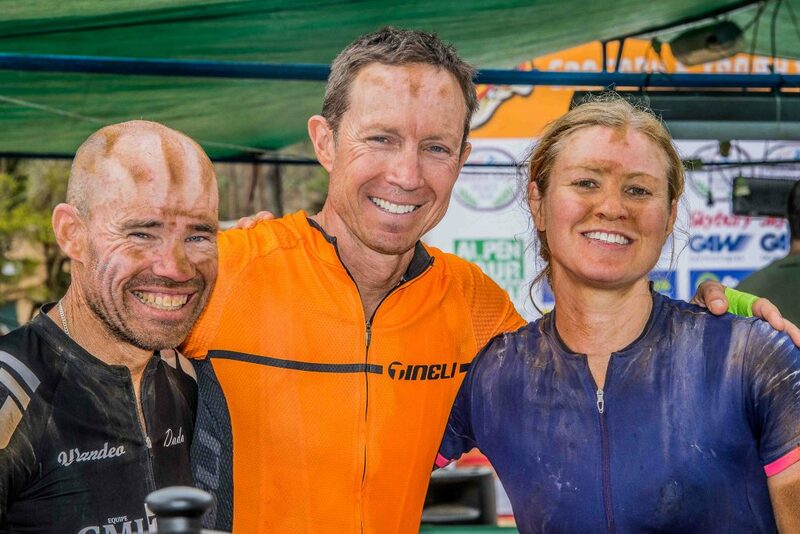 For these riders the event had turned into a very tactical race and the battle for stage wins – and the boomerang trophies that come with those – is now in full swing. Crocodile Trophy founder Gerhard Schönbacher said today that it was that racing spirit that he so enjoyed being a part of. After 24 years in the lead and track marking car he was able to finally do what he loved, chatting to ´his´ racers and crew and immersing himself in the event, “If I had known what a relief it would be to hand over the responsibility to a General Manager team, I think I would have done it years ago. I see my race from a completely new perspective and I´m having a great time!” He added that he was ´on call´ and available for the new management team with Regina Stanger and Koenraad Vanschoren at the helm of the Crocodile Trophy, but that he wasn´t “getting involved” in the day to day operations. “It is such a joy for me when riders come up to me for a chat”, he said clearly comfortable in his role and that he was looking forward to next year’s 25th Anniversary Edition. 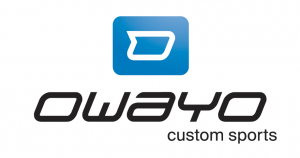 In the women’s Sjoukje Dufoer claims her second stage win on the relatively flat race track, which had been favourable for the experienced road racer. 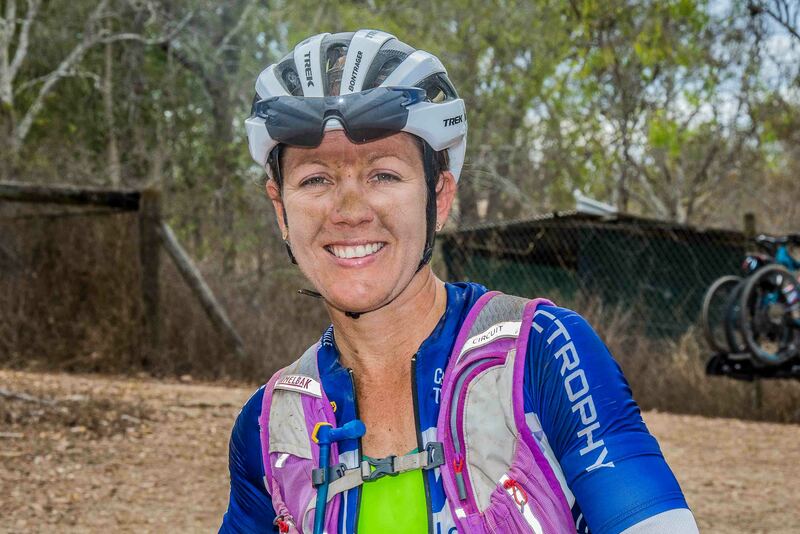 Sarah White defends her overall lead, finishing in second with a gap of seven minutes today. 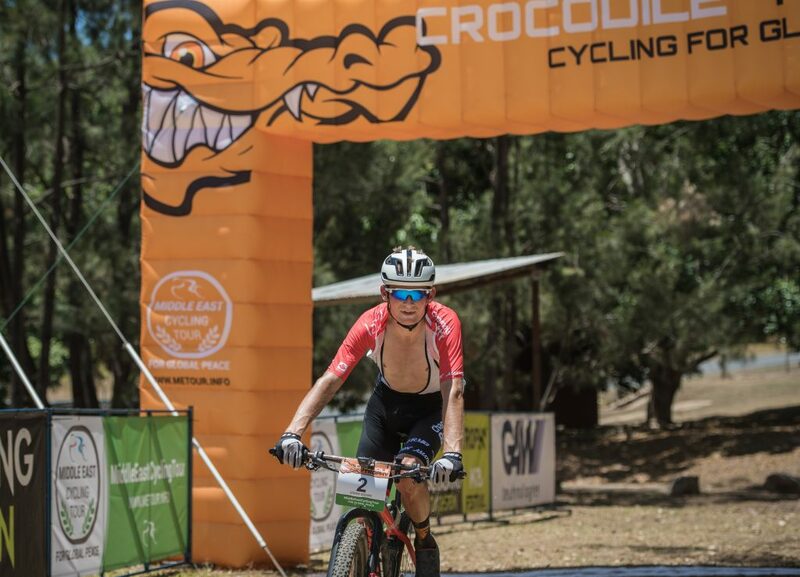 Lucy Coldwell is in third and has a gap of 14:36 min in the general women’s classification behind the local contender and 2015 Croc winner Sarah White from Cairns. Sjoukje Dufoer is in third overall by more than four hours. 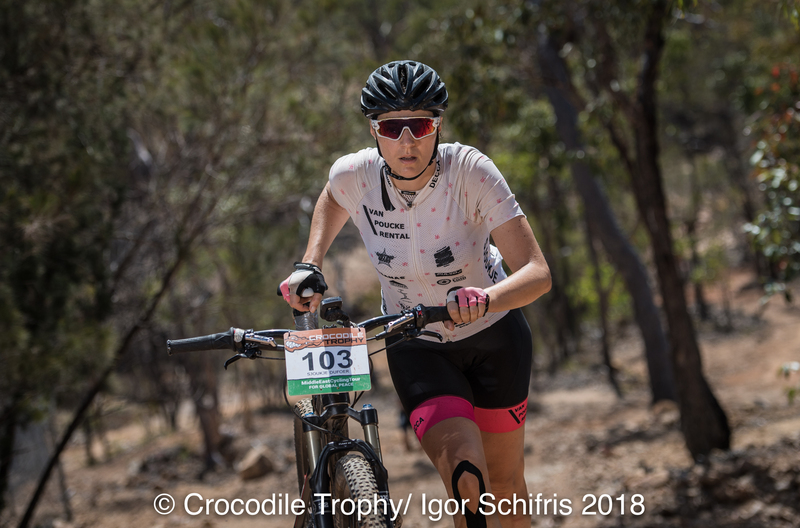 She said that the first three stages had been very challenging with the steep climbs and difficult and rough terrain, but that she enjoyed the racing experience and the event atmosphere. 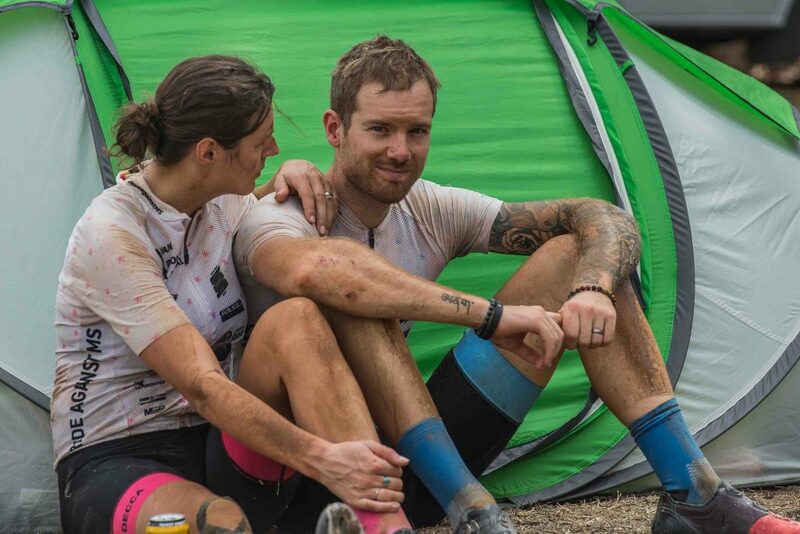 She added that she was very happy to take a second Boomerang for today’s stage win home as a souvenir from her adventurous honeymoon. Tomorrow’s second last stage will move the peloton on to Wetherby Station, an historic outback cattle station. 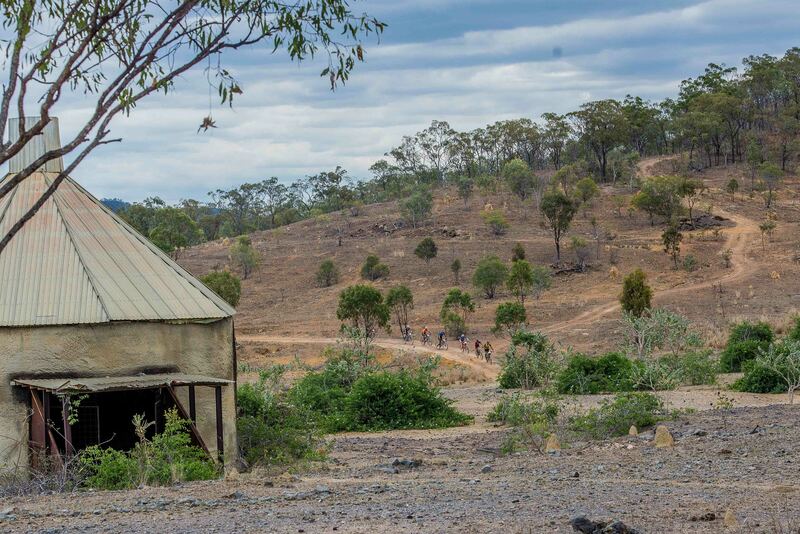 The marathon stage will be 102 km and 1350 meters of elevation. The Four Mile Beach arrival in Port Douglas is expected from 1pm with the official winners’ celebrations at 2pm near the Surf Life Saving Club. Sjoukje Dufoer and Tom Vandenbussche. 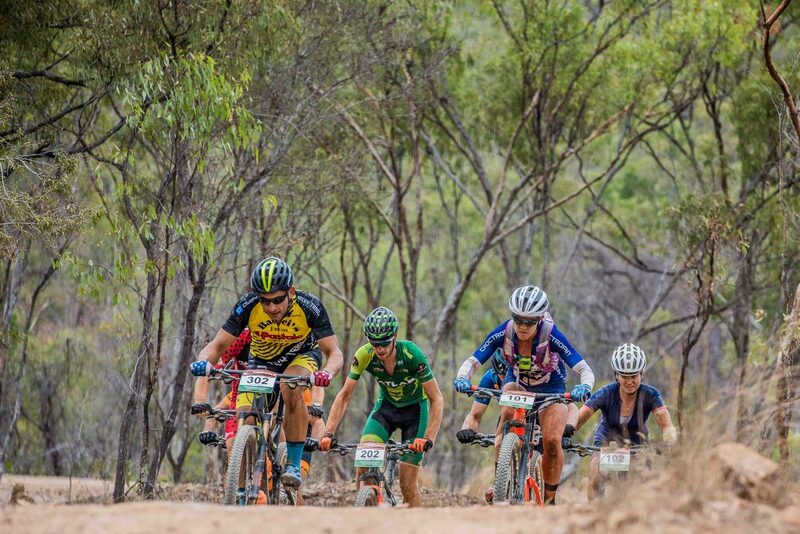 A hot day in the saddle – Sarah White (right) among fellow Aussie racers. 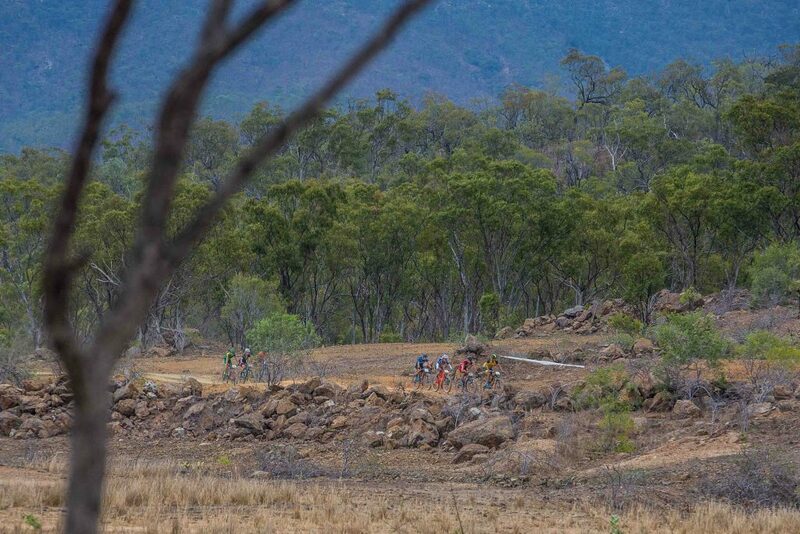 Outback racing via Stannary Hill mine. Croc country – the Australian Outback. Feedzones are set up every 30 km, riders can replenish food and water. Cattle grids, crossing countless properties.